We professionally position luxurious cinema seating to allow for maximal pleasure while watching your favorite videos on an outrageously huge screen! Smooth Automation delivers you the maximum in viewing AND listening pleasure. Through best-of-class technology. Using Black Diamond Screens by Screen Innovations right here in Texas, Sony’s latest 4K SXRD™ Home Theater Projector, combined with MartinLogan’s audiophile-grade, floor-standing electrostatic loudspeakers, our solutions represent some of the most compelling home theater systems ever brought to market! The best thing? 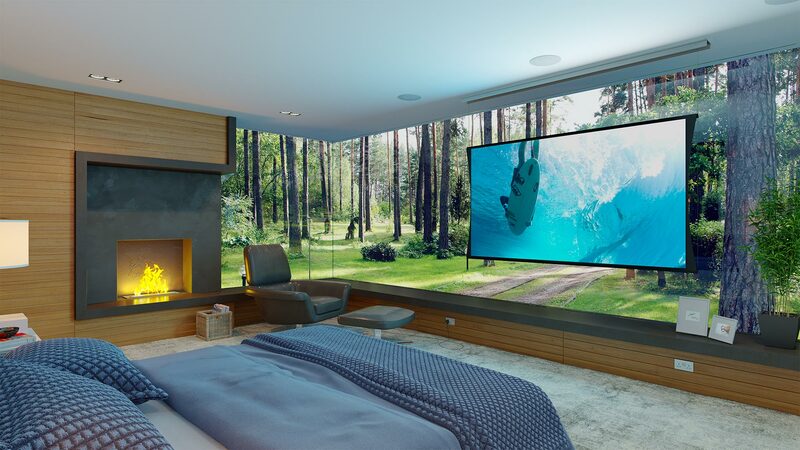 You are in absolute control of all the elements in the room using a simple, easy-to-use touch-screen, including room lighting to deliver the finest in screen viewability from a high-definition, expertly tuned projector. We work completely in concert with our high-end designers and prominent builder partners to guarantee you and your family a seamless design, build, and installation experience. Regardless of whether we are working in alignment with a new home build or complementing a complete remodeling project, Smooth’s team of technical experts and implementers provide turn-key installations that will blow away your audience’s collective minds every time the lights go down and your uber-cinematic experience begins!